4 Pics 1 Word Short ceiling. Woman with small waist. Woman tied. Narrow alley way. Skinny corridor. Thin door. Find the 4 pics 1 word answers you need and still having fun with the game that has hooked millions of people. 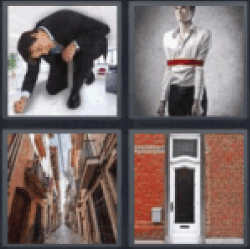 4 pics 1 word short ceiling.